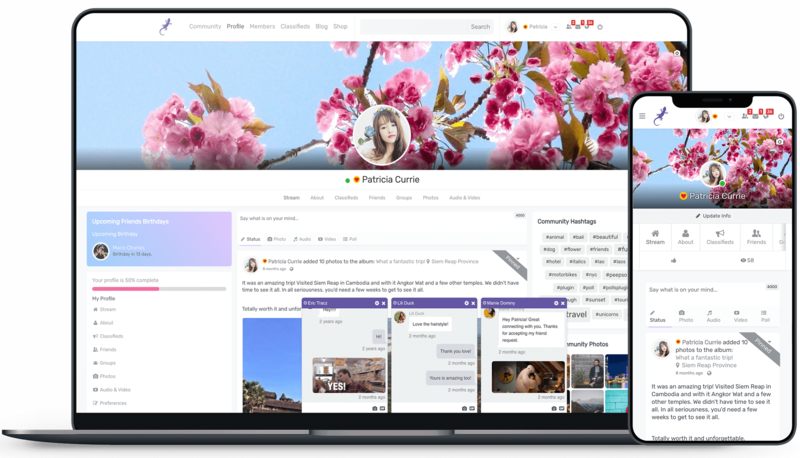 Users can set their own avatars and cover images. Profiles come with custom fields that users can fill in with information about themselves. Users can set their notification preferences, whether to show online status and many more. Users can like others’ profiles. Create custom profile fields for your community members. Birthday fields, multiple select, single select, date, url, country and more. Everything is done on the same page without the need to save and refresh. On the front end, the user can also edit their profile fields smoothly and seamlessly one by one. When hovering over user name (or taping on mobile) it shows a hover card with user's profile summary. Say more than a thousand Likes. Reactions on stream posts with emotional message such as Love, Laugh, Wink and much more. It features a built-in set of Reactions with a robust admin panel that lets you customize everything, add your own, change the icons, text and more. Hashtag search is built-in. You can search either by clicking a hashtag or by using the search field. Search also indicates to members what are the minimum and maximum character counts for hashtags. Search results will only show posts users are allowed to see, post privacy is respected fully. Integrate your Blog with your Community. Add Blog Posts tab to user profiles, featuring blog entries created by your community members. Automatically create a new PeepSo activity stream post. It is also capable of creating a PeepSo activity stream item each time a new WordPress post is published. This includes regular blog posts. CPTs (custom post types) are not supported at this time, they can be easily added with custom code, though. An activity stream item is created only once, no matter how many times you re-publish the related item. This does not include the ability to create blog posts on the frontend. However, it does include integrations with a 3rd party plugins which do allow doing it right from user profiles. WordPress blogposts can be reacted on and commented on. Comments and reactions are synced with the corresponding community posts. It can be used in both Posts, Comments and profile fields throughout PeepSo. Sent to admin user when new user registration needs approval. Admin has complete control over how the notification emails look like to match the style to Your Community. Shows newest community members, displays their avatars. Shows members who are online at the moment. Shows user's name, navigation and notifications anywhere on the site. Dashboard with an Overview of Your Community and statistics. PeepSo has extensive and coherent configuration. No programming knowledge is required. See what emails are sent. Configure intervals and batches of them to be sent. Choose your own color scheme to suit your site best. Pick from dozens of appearance customization options to personalize the look and feel of your community. Admins see the overview of all activity posts in the community. Built-in setting for terms and conditions that need to be accepted upon registration. Members list, including Member search and filtering. Built-in security configuration, preventing brute force attacks and more. Users can report content they don’t agree with or find offensive. Admins get notified about it. Built-in GDPR Compliance settings to help with making your community compliant. Possibility to ban users temporarily or permanently. Completely white-label experience. Brand your community however you want. Warning users they're about to leave your site.